Do real, everyday vegetarians love portobello mushrooms as much as we do? Now that we’re excluding meat from our cooking, portobellos are a natural go-to at the grocery store. And when I’m eating them, I don’t even miss meat! Craziness. Even though we’ve been a little lax about posting during May, we’ve had some great dinners and found some delicious new vegetarian discoveries. 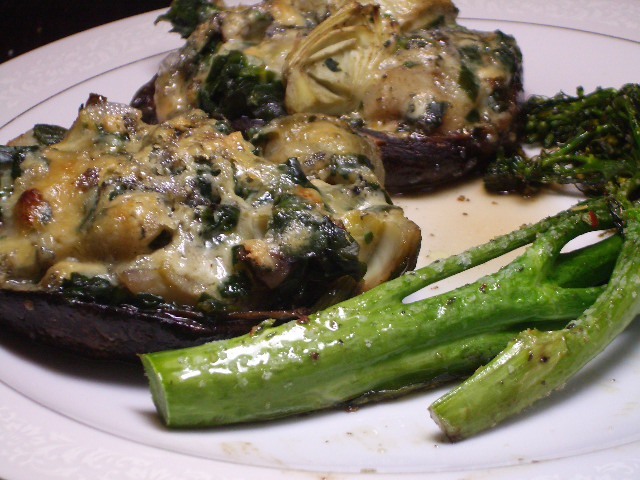 This is a return to an old idea for us: we’ve stuffed portobello caps with artichokes and spinach before. This time we changed it up a little, marinating each portobello cap in balsamic vinaigrette before stuffing them full of goodness…the result was delicious. This is one I am going to try!!!!! These look amazing! I wonder if they would work well on the grill?